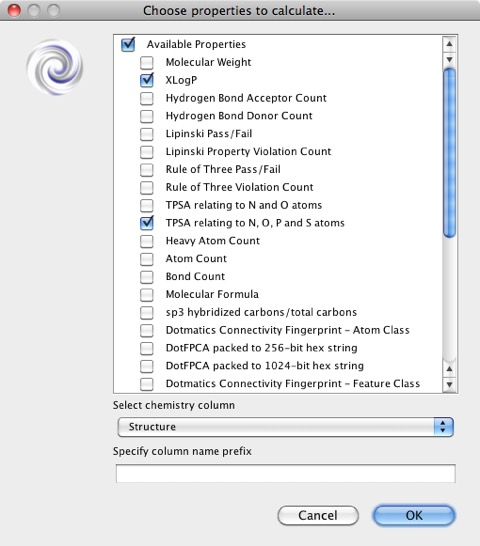 In the three previous tutorials we have used the built in scripting facility within Vortex to add a wide range of calculated physicochemical properties, whilst these properties a very useful in their own right for filtering or sorting groups of molecules they can also be used as the key components of quantitative structure-activity relationships. Whilst Vortex has tools that allow you to do some analysis and of course you can use the scripting facility to access statistical or model building packages like R in this tutorial we will be using a model taken from the literature and implementing it within Vortex. One of the most challenging area of drug discovery research is neuroscience, partly because of the complexity of the biology but also because the brain is protected from potential drugs by the blood-brain barrier (BBB). In order for drugs to access the brain and exert their therapeutic action they have to cross the BBB and in many drug discovery programs this becomes a key parameter in the optimisation program. There have been many models built to predict brain penetration, many of the earlier models use measurements of plasma and brain concentrations of drug usually expressed as log(Cbrain/Cblood) or, more simply, log BB. It has been observed that compounds with log BB > 0.3 cross the BBB readily, while compounds with log BB < -1.0 are only poorly distributed to the brain. Whilst this sort of model has been superseded by models built on occupancy data it is adequate for demonstration purposes. Where PSA is the polar surface area and ClogP is the calculated logP, both of which can be calculated within Vortex using algorithms which based on my limited testing appear to give results comparable to those in the original publication. After importing a sdf file containing the structures you can either use the built in calculation functions to add the appropriate fields (Tools:Calculate Properties). The fields will then be appended to the end of the spreadsheet of structures. 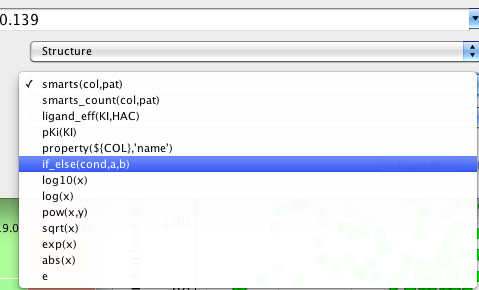 Alternatively you can use one of the scripts 1, 2 or 3 to use an external application to calculate the properties. 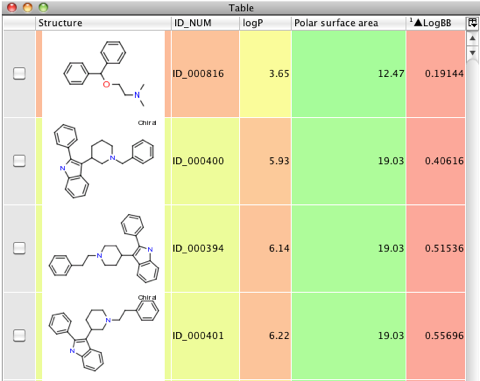 With the calculated physicochemical properties in the database we can now use them to build the predictive model. 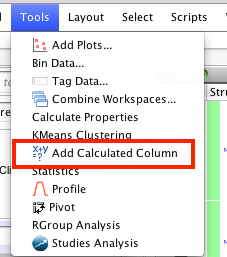 From the Tools menu choose Add Calculated Column. 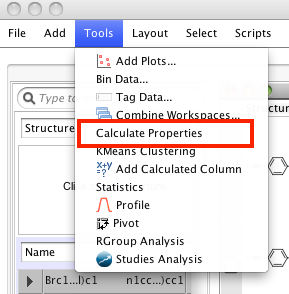 This brings up the calculation dialog box, first give the new column a name “LogBB” then build up the expression needed to calculate the property. Type in “-0.148 *” and then choose the column containing the property (Polar Surface Area) then click the “add” button to add it to the column expression. 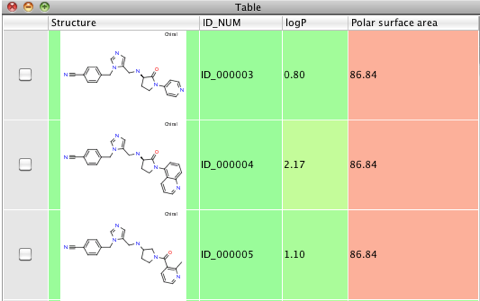 Now click OK and the column “LogBB” will be added to the spreadsheet and the cells populated with the calculated result. 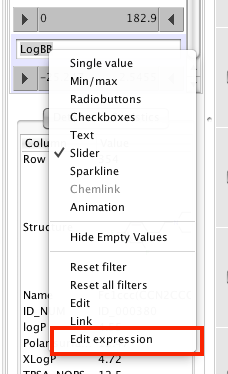 If you decide you want to edit the expression right-click on the field in the left hand filters panel and select “Edit Expression” from the drop-down menu. At the moment it is not possible to delete columns, so if you decide you longer want the calculated column the best way to remove it is to choose “Export” from the file menu, select the columns you want to keep and then export to a new workspace (or as a text file or sdf). If you save to a new workspace remember to save it! Whilst this script uses basic arithmetic expressions there are also a range of more extensive logical and arithmetic expressions available, in addition you don’t have to populate a column with a calculated physicochemical property to use them in a calculated column, you can simply call them directly. This is obviously a very simple example but you can use the same technique to build more complex examples taken from the literature or ones that have been built in house.